You can only control 1 “Oboro-Guruma, the Wheeled Mayakashi”. You can only use each of these effects of “Oboro-Guruma, the Wheeled Mayakashi” once per turn. 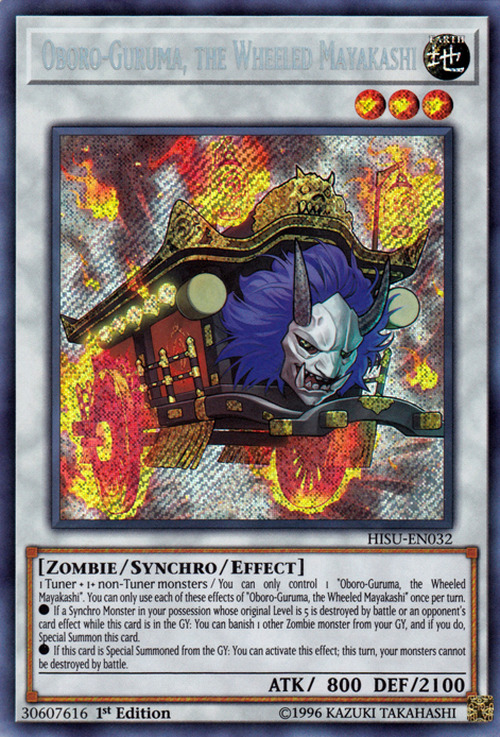 ● If a Synchro Monster in your possession whose original Level is 5 is destroyed by battle or an opponent's card effect while this card is in your GY: You can banish 1 other Zombie monster from your GY, and if you do, Special Summon this card. ● If this card is Special Summoned from the GY: You can activate this effect; this turn, your monsters cannot be destroyed by battle. This cards's name comes from Oboroguruma (朧車), a spirit of ox cart in Japanese folklore. Oboro (朧) means dim, shrouded while guruma (kuruma) means cart. 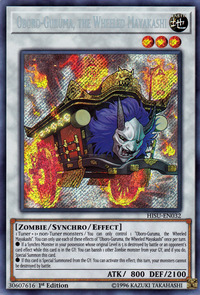 This monster is the Synchro counterpart of Shafu, the Wheeled Mayakashi".